Instead of difficult to code, maintain and understand Excel IF statements, rules are entered directly on the spreadsheet in a natural and easy to understand syntax. The rules can then be queried, much like a database. Decision making criteria are often written as rules. Rules such as these do not imply any particular method of use, but rather express logical relationships between conditions and conclusions. Rules are coded almost directly as naturally expressed. Initial coding of the rules is easier. Maintenance of the rules is much easier. Errors in the code are drastically reduced. Domain experts can readily verify the rules as correct. The more complex the rule set, the more the advantages hold true and at a certain level of complexity and a rule engine such as the Conditional Rules for Excel becomes the only viable alternative. 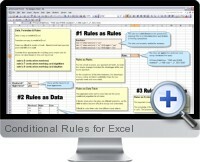 Conditional Rules for Excel is ideal for Sarbanes Oxley compliant spreadsheets with easy to read and audit business rules that generate or verify results. The download includes examples of conditional rules applied to Excel models for pricing, product advice, product configuration, planning/work flow, business rules (incorporation, loan approval, licensing), legal document assembly, and medical advice (vaccination planning).